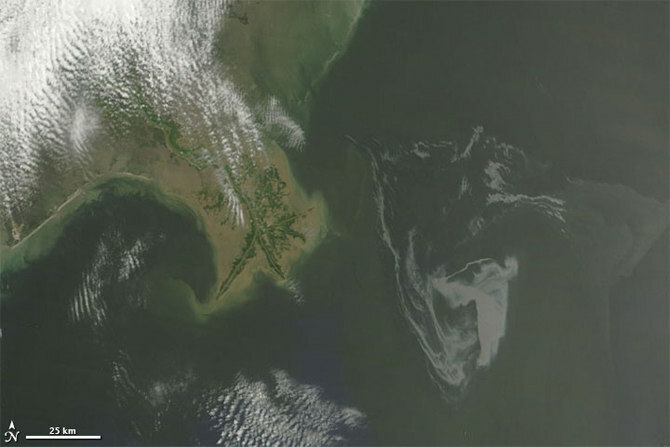 NASA released updated satellite imagery of the oil spill caused by the April 20 explosion of the BP-operated Deepwater Horizon offshore oil rig. Over 5,000 barrels of oil spilled into the waters of the Gulf of Mexico causing a stain that now covers 2,000 square miles. "In an incident like this, coastal birds will be among the hardest hit. There are millions of birds at risk as the US Gulf coast is not only home to many resident species, but also a regular refuge for many birds migrating north," said Dr. Ian Robinson, IFAW Emergency Relief Director. Species at risk include terns, herons, egrets, gannets, ducks, and Louisiana's state bird, the Brown pelican. "When a bird's feathers become clogged with oil they no longer act as a waterproof coat. Cold water penetrates to the bird's skin and rapidly leads to hypothermia," added Dr. Robinson. "At the same time, as the bird preens, to try and clean the oil from the feathers, it inadvertently ingests toxic oil which leads to symptoms of poisoning, including diarrhea and dehydration." Marine mammals and sea turtles are also at risk due to the volatile chemicals that will be inhaled when they surface for air and the oil that will cover their bodies as they swim. To report oiled or injured wildlife, please call 1-800-557-1401. To report oil on land or for general Community and Volunteer Information, please call 1-866-448-5816. The Deepwater Horizon oil spill (appearing as a dull gray color) is southeast of the Mississippi Delta in this May 1, 2010, image from NASA's MODIS instrument. Credit: NASA/Goddard/MODIS Rapid Response Team. Photo Credit: NASA/Goddard/MODIS Rapid Response Team.